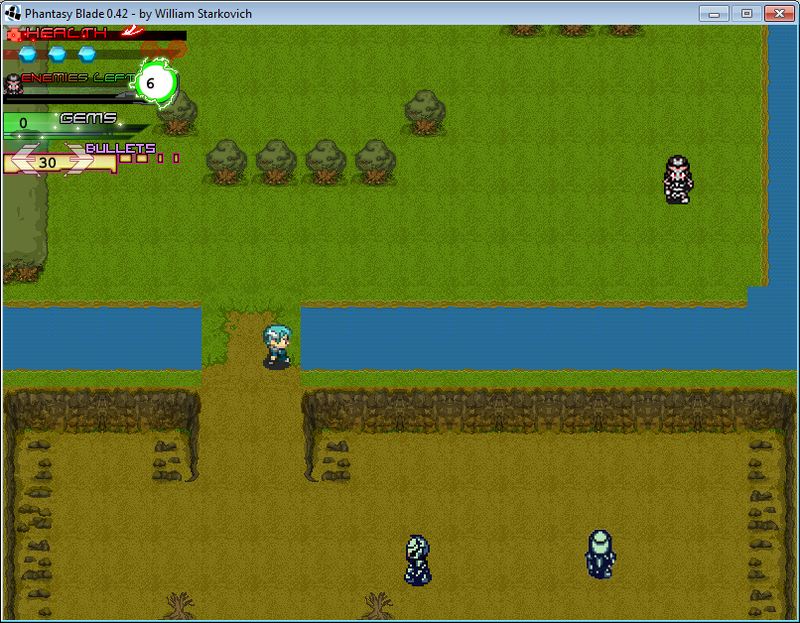 Phantasy Blade is a zelda clone. 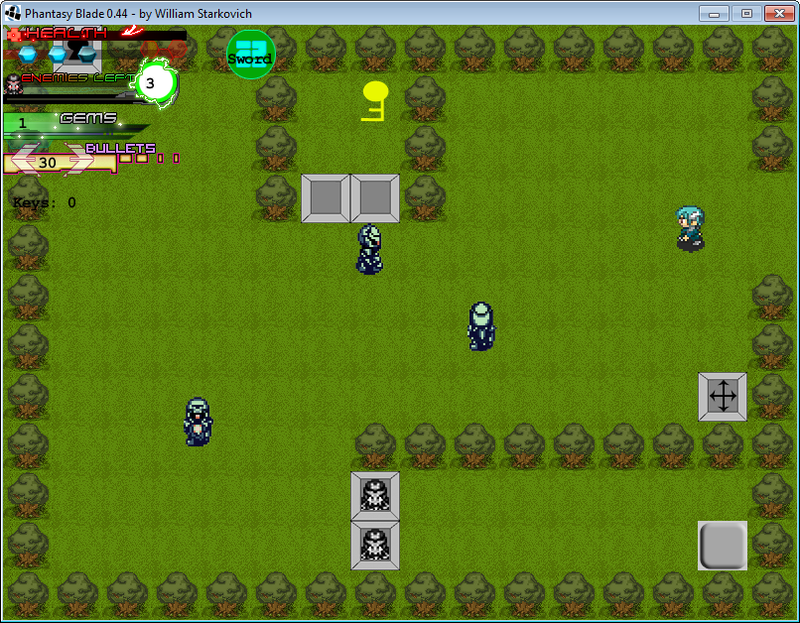 The final version of the game will have puzzles, dungeons, items to use, and lots of secrets to uncover. Those clouds get a little annoying. Maybe less clouds? the comp I am on doesnt work with lwjgl . Hey boys and girls, check out my latest game, Phantasy Blade! It works fine here. It is a good start. I would like to see the clouds moving in the same direction because it is strange to see them going back sometimes It reminds me Zelda on Super NES. Please can you tell me which symptoms you have. Do you have an error log? any exception? Which graphics card does this computer have? Maybe we could report this bug if any. ah thats a pretty nice improvement cyanprime, much better then the version I saw last time. 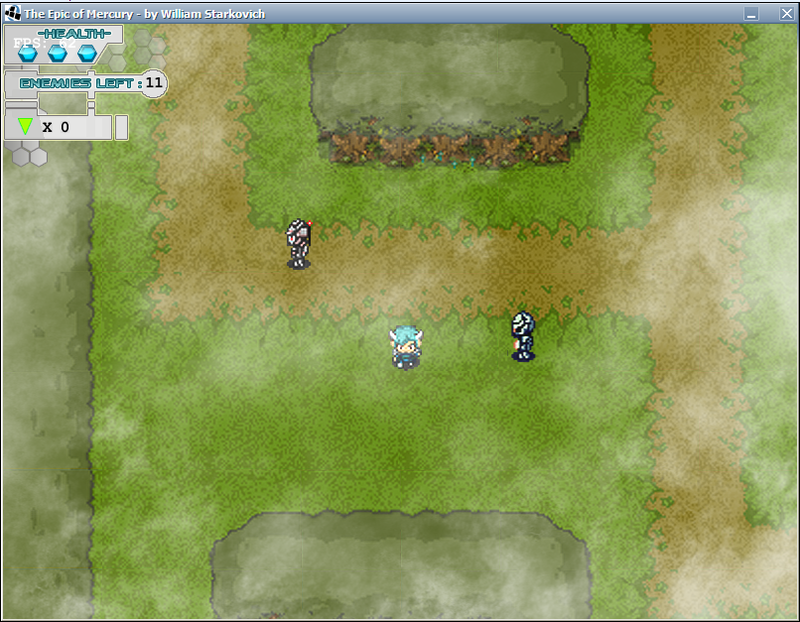 from a graphics point of view its very nice, the small sprites look pretty good. Two things stand out though which sort of break consistency, first is the border on the tree sprites, that could be improved a little to make them fit in better. Second is the triangles used to represent the health bar, they don't look that good, maybe the colour used on those needs to be darker or they need a colour gradient. Sounds is pretty good, very nice. Atmosphere is nice of the game is nice and the fog gives it a nice feel. keep up the good work, looking forward to it becoming more of a game. when will be more levels? updated the screenshot. WIP of alpha 3.
once again, I am not on an opengl enabled computer, so I am goinng ot hav eot try it later. 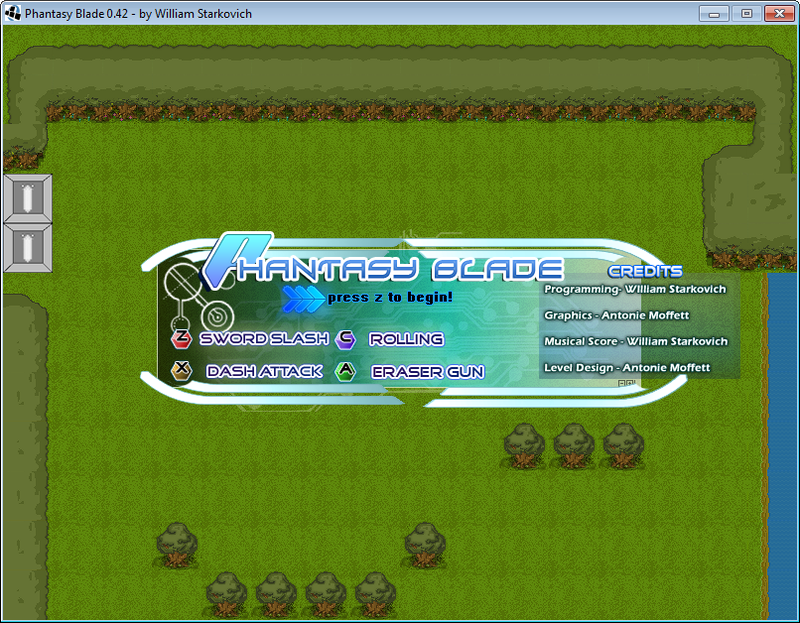 Phantasy Blade Alpha 3 released! I will try your game if you remove that utterly annoying banner from your sig. Why do you find his banner annoying? Personally I find it pretty. I have seen your locked topic... I don't hate you, I try the games (including yours) as often as I can even though I'm very busy with plenty of things. 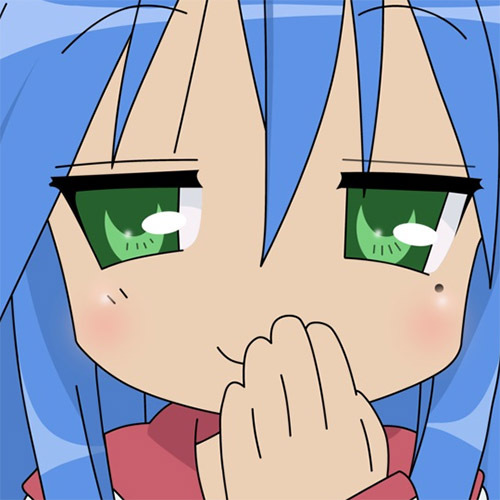 When I learn another game has been open sourced, I smile because I think it is a fair decision. The new attack is fine but please update the list of controls otherwise people won't guess pressing X allows to use another attack. It would be fine if you could add a twirling attack. My opinion is that each banner is annoying and disturbing, no matter how pretty it is. I think that images in sigs should not be allowed on this forum. Sorry for being off topic. any chance the slick.jnlp can have solaris natives added to it? I have a difference in graphics from your screen : trees are outline by a bright green color. Pretty fun. Definitely a good start. One thing that I think needs to be improved a lot is the enemy AI and the variety with them. It was often pretty boring because everything was just the same, more or less. I imagine you're still in the process of doing more, anyway. But yeah, more enemy types and more weapons. I want to be able to do different things in different situations. And the attacking doesn't feel quite fluid at this point - it would be nice to do different things with my sword than just a poke that freezes me in place. I couldn't beat the boss, given that he was completely random and therefore had no pattern to get "good" at. He would just stomp me no matter what. Not to forget that he was annoying in general, because I had to go after him to even fight him, then he would randomly go another way. He definitely needs some sort of AI and pattern. although the interface looks a bit too smooth now to go with the retro look of the game. that looks like a really cool hud. 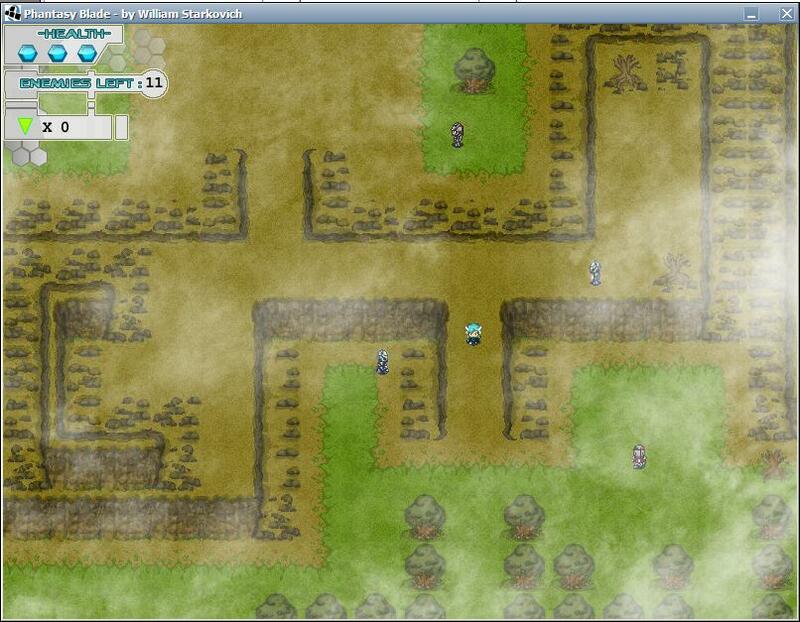 Your last screenshot looks a lot better zoomed in, but I preferred the graphics looking more sharp. Can't you just use nearest neighbor instead of a linear filter? Yeah good idea bilinear filtering would look much better. That's it! ta. Let it loose on your sprites CyanPrime, it could make them look a lot better when zoomed in. You could also touch up the scaled versions by hand in paint.NET too. This wikipedia article has various methods. I personally would disagree, in this case and also in general. Still needs a lot of tweaking, but it's getting there. - The enemies' sight boxes make them seem incredibly retarded. The fact that I can stand directly next to one and cut him over and over without him noticing is silly. - In the beginning, you can do a sword charge even though you have no sword. - The eraser gun seems like crap. It uses 3 bullets every time, so your ammo runs out incredibly quickly, and it does practically no damage. I'd rather have a very high damage, low ammo weapon, or a very high ammo low damage weapon. - The enemies and the characters' total allowed actions still are not lively enough. Being able to do different key combinations to spin attack and like would be nice. It would also be nice to be able to fight enemies without them literally walking on top of me to kill me (the player/enemies should be knocked back when they take damage, for starters). - The enemies really need to move in a pattern instead of randomly. It's important for the player to be able to predict what they will do, dodge attacks, etc. Think Zelda. Some will see you, run in place for a moment as they "build up speed," then come charging in a straight line at you. This gives the player a chance to time when he should move aside. Others shoot arrows at where you're standing, and others just move in crazy circles or weird patterns. Either way, they all have absolutely no randomness whatsoever. And this really is an important feature of games like this. The player can't feel like they're on for a wild ride where they hope they can get lucky in order to win. It needs to be all skill. - The last two enemies (I have no idea what they are) are just stupid. The fact that the moment I enter their site box I become insta-dead and have to redo a bunch of crap is just dumb. Perhaps they should do one damage like everything else? I really don't understand the reason for making them so stupidly powerful. I would do a charge attack that would hit them in the back, travel through them, and then end up within their site box. And then I would die instantly. Hip hip hooray. I also think you should be able to push back the enemies. Also, I think that the enemies should have a attack animation so you can roll away and dodge it. I like the graphics though, and the music is nice. EDIT: also, what do I do after killing the boss?